“With just 4 percent of federal funding going to pediatric cancer research, we’ve made it our mission to not only support funding initiatives but bring joy and happiness to the daily lives of children battling cancer,” said Triumph Over Kid Cancer Co-Founder Mecklin Ragan. This year’s events will feature live music, unlimited food and drinks, both silent and live auctions, raffles, games, special guests and MORE! 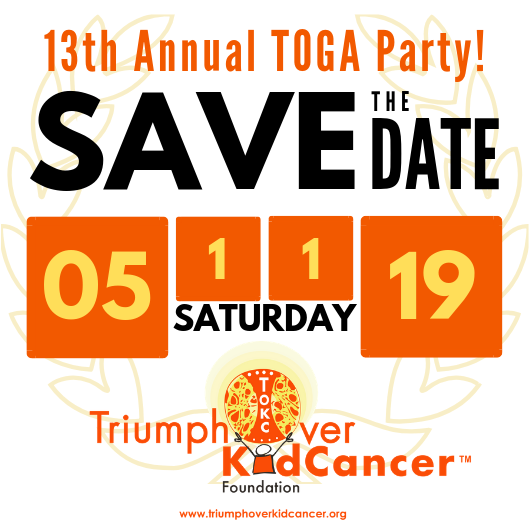 This year’s TOGA brings together a community of over 350 Friends & Funhavers from all over to be the HOPE and JOY to kids with cancer by raising awareness AND funds for pediatric cancer research.